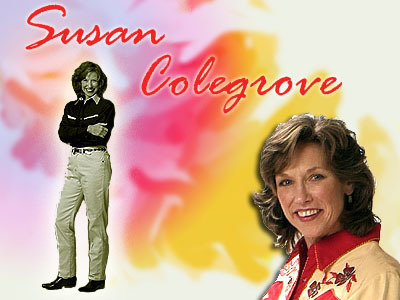 A native of Fort Worth, Texas, Susan Colegrove was born into a musical family in 1951. She showed an early interest in piano and began lessons at the age of nine. Piano soon took a backseat to stringed instruments - first baritone ukulele, followed by tenor and finally six-string guitar - as she followed her two older brothers into the folk era of the early sixties. Soon after entering seventh grade, Susan found a kindred spirit and folksinging partner in Julie Smith. The two immediately became a duo and set about performing anywhere they could. For seventh graders, that meant talent shows and Kiwanis Clubs. Billing themselves as Glycerin and Rosewater, the duo persevered and two years later, at the age of 15, began playing regularly at the only folk club in the area, The Rubiyat in Dallas. Within two years, time and distance took its toll on the duo, and as the folk boom ended so did Glycerin and Rosewater. Susan’s interests veered into drama and theatre throughout high school and a brief college career, although she continued to play and sing. The spring of 1974 was spent in Los Angeles, where she recorded 10 unreleased sides for a now-defunct record company. That fall, Susan and Julie reconnected as friends and went out one evening to hear a new band in Fort Worth, Little Whisper and the Rumors. By the end of the night, the band’s bass player, Jim Colegrove, sat down at their table... and that was that! The good news is that Susan and Jim were married two years later as the bicentennial came to a close; the bad news is that her public singing career was, for the most part, over. From the early days of their relationship, Susan and Jim sang around the house together, and he always found a way to work her into his recording projects as a background singer. She can be heard on Jim Colegrove’s Panther City Blues (1979), the Juke Jumpers’ The Joint’s Jumpin’! (1981), Sid King’s Let’s Get Loose (1982), Larry Stone’s Rockin’ Bones (1983), and Kenny Wayne’s Borned With the Blues and Raised On Rock 'n’ Roll (1980). From time-to-time Susan performed onstage with the Juke Jumpers. After the Juke Jumpers stopped touring, Susan and Jim’s repertoire continued to expand and their 25+ years of singing together finally brought them together in Lost Country®. ©2007, The Cool Groove, All Rights Reserved.